Untransmitted TV footage obtained by Rehad Desai of the Marikana Support Committee and Uhuru Productions, a local documentary production house, shows that the police have told lies about their role in the killings at Marikana. 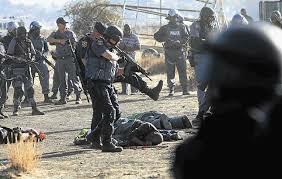 The police have always insisted that officers spontaneously used their firearms in the face of an alleged imminent attack by miners that jeopardised police officers’ lives. The new footage has been analysed by Rehad Desai and James Nichol, a UK solicitor assisting the Social Economic Rights Institute who represent 34 families of the miners killed on the 16th August 2012. 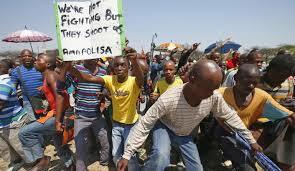 The miners were peacefully leaving the mountain at Marikana shortly before they were attacked by police. Drop all charges against the arrested miners. The footage in question will be shown and DVD copies of the footage will be made available to the press and the commission of inquiry simultaneously. The DVDs will be data discs as we will provide stills of some of this key evidence.